So my quest for the Sensible Bicycle is over; I found it. Or rather, it found me, for bicycles have lives of their own. Curbside Cycle had a sale. They also had, for reasons known only to the manufacturer, been sent just one of their top-of-the-line Batavus Crescendo Deluxe city bikes. 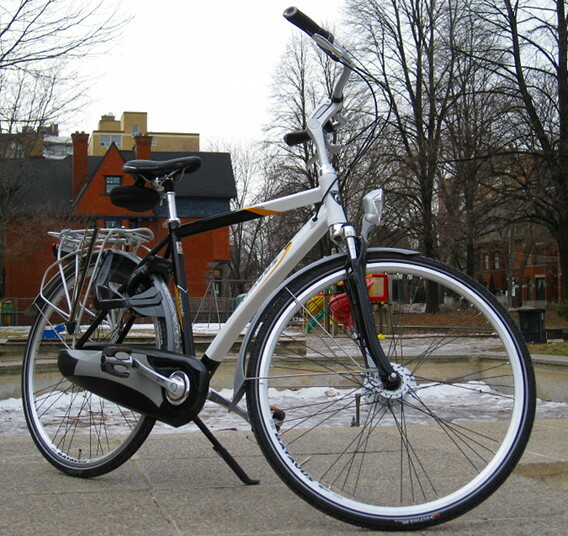 I took it for a test ride in the ice and slush of the Annex. It did everything just right. Fully enclosed chain — yup. Batavus have a really clever clip-together sectional polymer chainguard. Full mudguards — for sure. Hub gears — 8 speed hub gears, no less. Dynamo lights — a front dynamo hub, no less. Slight marks off for a battery rear light, but it does make the wiring simple. Proper carriers — a really nice alloy one, with built in pump and elastic strap. Anything but rim brakes — roller brakes, in the hubs. I was initially sceptical of their gentle action, but they can stop you to almost the limit of adhesion of the tyres, so they do work well. The one thing it does have, but I didn’t think I’d need, is suspension. It irons out the uneven Scarborough spring roads rather well. I love the manual; it’s written for sensible riding. Basically, most advice is given as Talk to your Batavus Dealer. The similarity to a modern car manual is striking; just you get on with riding the thing, it implies, and we’ll worry about fixing it. Tellingly, the English language section is the back; these bikes are much too sensible to waste on those silly Anglos. I’ve barely walked the length of myself in the last few months, so in even short distances my legs let me know about it. It’s freezy out, but dry and bright – I must go out on my bike again. I say, beware of all enterprises that require new clothes, and not rather a new wearer of clothes. If there is not a new man, how can the new clothes be made to fit? Awesome! I had to retrofit the wheel lock that I bought in the Netherlands onto my Devinci LifeStyle last year. Does yours have the clamps? Or does it actually come with the lock mounting building into the frame like the ones I saw over there? Previous Previous post: the glowing-eyed teddy bear of DOOM!!!!!!!! !